p(blue). Editor's note: We are pleased to feature the work of David Mas Masumoto, a farmer and writer in California. Occasionally we will feature excerpts from Masumoto's books in the Dinner Guest Blog. Most of the excerpts, like this one, are in letter form. As a transplant from outside the Central Valley, now working at the University of California, Merced, you are spending one of your first winters here. Like this institution, you plan to stay here a while. But because you are new to the Valley, I’m not sure you understand the culture of fog. Heed my warning, Kenji: There will be days when the fog is so thick you can’t see beyond a few feet in front of you, and there may be times when the sun hides for weeks. Fog: treacherous, dangerous, a cold, unforgiving character that tricks newcomers. People drive too fast; traffic accidents blanket the countryside; fresh skid marks are painted daily; and cars and trucks pile up with fatalities. We’re forced to adapt to the curse of going slow, a pace that doesn’t seem to fit with the larger world. Schools still mind the weather in the Valley. Foggy-day schedules delay the start of school, some kids (and a few teachers) cheer while bus drivers groan. We’re compelled to accept nature’s timeline, a piece of our rural past not to be dismissed. Peaches and nectarines need this winter cold. 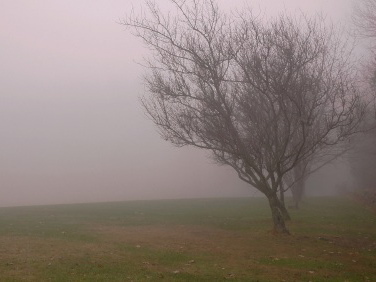 Fog helps keep temperatures below 45 degrees and the “chilling hours” necessary for trees to slip into a deserved dormancy and awaken renewed. And why not farmers? I’m convinced the American work pace, with little time for vacation, is unnatural and unhealthy. Fog helps remind me that down time, extended morning breaks, even naps and respites, are not necessarily evil signs of weakness. But Kenji, I trust you’re learning to work in the fog. I sense you understand how farmers can trudge into hazy fields in winter and lose themselves in a wondrous world. Robbed of sight, the other senses are heightened. The hum of traffic can be heard in the distance, barking dogs warn of strangers, even birds continue their songs in winter. Listen to the moisture drip, drip, drip from leaves like a natural timepiece, a perfect slow pace to work while reflecting. Forced to use other senses, we find the surrounding world stirs with new life. I recall one Christmas day when my grandmother journeyed out to prune vines, a 70-year-old bundled up to snip, clip, and slice in the fog. I located her by listening to the snapping of grapevine canes accompanied by the screech of trellis wires. Hidden in the fog, she seemed content in her work, a moment of peace in her adopted land, even during that holiday. Fog reminds me that this is a land of work, places where people still value productivity and hand labor matters; we’re still blue-collar and real. Hard, honest work speaks about our character as we labor in the fog. My initiation program will reveal stages of acceptance. First, the recognition of the wet chill wrapping its cold fingers around you. The Valley: dense and damp, robbing you of the sense of sight, a symbol for a lack of vision? Then will come another side, trusting your other senses and an odd sense of security, a feeling of solitude while working in the fog. Perhaps fog protects us from outsiders and allows us time to ponder while life slows down. I’ve heard of leadership retreats with participants hiking at night without light; the personal training of leaders as they maneuver through uncharted territory, trusting their senses, listening to instincts, separating the fools from the thinkers, distinguishing the overly cautious or wild from those with the wisdom to slow down and think. Can’t our relationship with fog be a metaphor for development in the Valley, our fields of practice for smart growth and sustainable planning? Perhaps it’s OK to slow down in the race to develop our lands instead of communities rear-ending each other and creating massive traffic jams. Can we move forward steadily but paced? For the moment, our stories may be hidden, a secret even to those who live here. One day though, I imagine UC Merced, Fresno State, and our other institutions of learning rising out of the Valley’s fog. While we may be invisible in the fog of winter, we’re working to prepare for spring. I’ll take my stand in the fog. This is who we are, part of the story of the Valley. As for those in the rest of the state who disdain our culture, perhaps they are the ones lost in the fog.